Buy any 3 Cat Treats and get the 4th free. 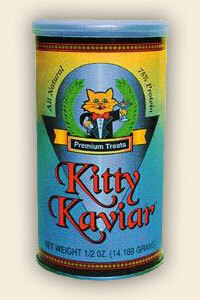 Kitty Kaviar is an all-natural fish treat for cats of all ages. It is made from dried Bonito filets, carved paper thin, and has no additives, preservatives or by-products. Bonito is a schooling fish of the tuna and mackerel family. Kitty Kaviar possesses a strong, fish-like aroma, which entices felines. Kitty Kaviar is 75% protein, max 3.80% ash and 0.095% magnesium, and is a good source of taurine (35%). Cats are often unable to synthesize essential nutrients, such as the amino acid taurine, from plant matter. Taurine is used in body growth and tissue repair. Ash and magnesium are both minerals used in the body that are important for bone and tooth structure. One of the benefits of Kitty Kaviar is that it is low in ash and magnesium. Lowering magnesium and ash helps to decrease damage to kidneys and helps to prevent urinary tract diseases. Dogs love Kitty Kaviar too!